I really could not post a better recipe to celebrate the first day of spring tomorrow. These macarons honestly taste like springtime. They are light, floral, sweet, and fruity. Since my first venture at making macarons I have fallen in love with making them. I am constantly thinking of possible flavor combinations...I mean constantly. Zack even came up with a flavor idea tonight at diner, but I am going to save it for later when I actually make them. 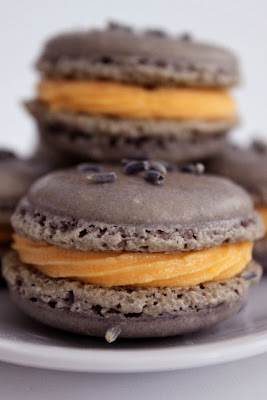 I am not quite sure how I came up with this flavor combination, but the lavender paired with the orange honey buttercream really worked perfectly. I used the same exact method to make these as I did last time and it worked perfectly. When we made macarons at Ellen's house we put her oven up to 300 degrees Fahrenheit. My oven runs hot so I actually baked these at 285 degrees Fahrenheit. If you have been wanting to make them and haven't because you were afraid they would not turn out you should definitely give them a try. In a stand mixer fitted with the whisk attachment, white the egg whites to a foam. Gradually add the granulated sugar and food coloring until you obtain a glossy meringue. Do not over bear your meringue or it will be too dry. Place the powdered sugar, almond meal in a food processor and pulse until well mixed. Add them to the meringue, give it a quick fold to break some of the air and then fold the mass carefully until you obtain a batter that falls back on itself after counting to 10. Give quick strokes at first and then slow down. The batter should fall back on itself and flatten (about 50 strokes). Fill a pastry bag with a plain tip (I used an Ateco #809) with the batter and pipe small rounds (1 in in diameter, as they will spread) onto parchment paper or silicone mats lined baking sheets. Sprinkle with lavender petals. 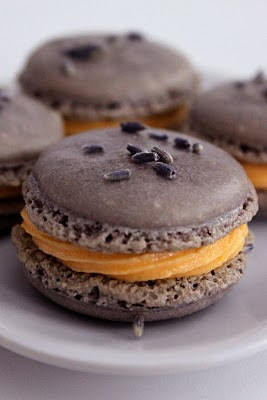 Let the macarons sit out for at least 30 minutes, up to an hour to harden their shells a bit. Preheat the oven to 300 degrees Fahrenheit (285 if your oven runs hot like mine) and bake for 20 minutes. Let cool completely before filling.